In this online quiz, second grade students will practice adding two or three two-digit numbers. This quiz has 10 problems: five multiple choice, four drag and drop items, and one matching problem. 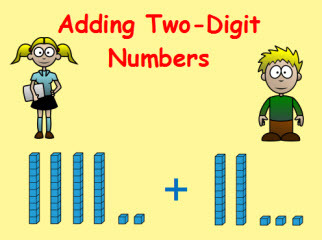 Kids will use place value and properties of operations to add two-digit numbers (with and without regrouping.) Some problems are written horizontally, some vertically, and two have models with base ten blocks. Return from this Adding Two-Digit Numbers to the Elementary Math Tests , 2nd Grade Math Tests webpage, or to Math Tests.